We went to the Zoo today and I took this photo of Noah as he watched the Sea Lion swim by. 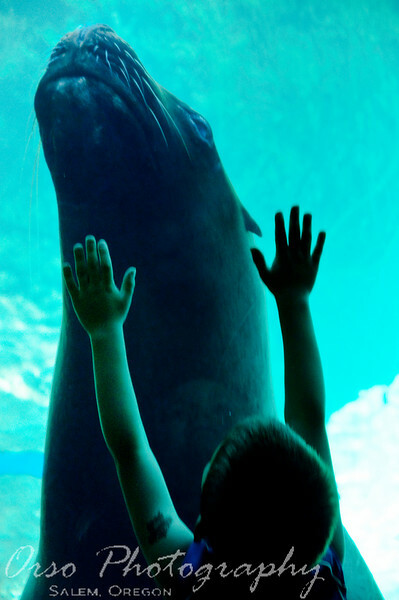 It kept swiming back and forth, and when it came close to the glass, Noah could not help by raise his hands ~ he was very excited to be at the Zoo today. Beautiful shot...love the feeling it expresses. Terrific shot, really shows Noah's excitement...would make an excellent ad for the zoo. This shot speaks volumes about our youth and the responsibility we have. Fantastic image! This is stunning. You should submit this to National Geographic's photo of the day ( or month) contest. Seriously - it has a really good chance of winning recognition.